All rides start from The Green, Blakebrook, Kidderminster, DY11 6RG unless otherwise stated in the calendar. How far and how fast do you go? Do I need to be a member of Cycling UK? and the backing of national organisation. Do I need to book to go on a ride? first ride, contact the ride leader or secretary. See home page for details. 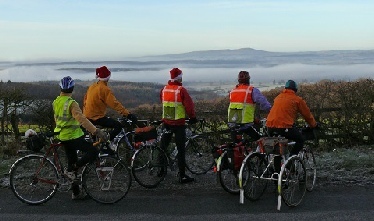 The Kidderminster CTC rides are free to participants. All you need is money for cafe stops. in the group will be able to do it for you. I'm worried about being left behind. get too steep we do get off and walk. What happens on a Sunday ride? or two to a cafe for coffee, cake or bacon sandwich. Then after another hour’s ride we stop for a picnic lunch. Afternoon is another hour or so’s riding to a cafe for afternoon tea. Finally we ride back to Kidderminster. Normally rides require you to bring a packed lunch. Sometimes lunch is at a members house or a cafe, the ride details will state this. It is always important to carry some food supplies with you such as energy bars just in case you get hungry or tired. Always carry something to drink as well. Lights are essential for the evening rides and in the winter when it gets dark early. It is expected that regular riders fit full length mudguards to keep others dry and dirt off the furniture of the cafes we use, a rear mudflap to give that extra bit of protection to cyclists behind you is also much appreciated. 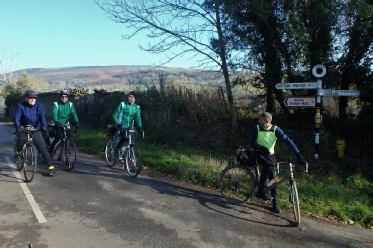 Newcomers to group riding can find more information in the ‘Leaflets/Doc’ page here.